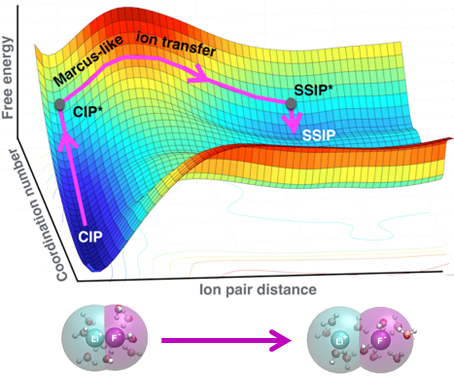 The dissociation of ion pairs involves two stages: (1) an increase of the water coordination about the ions (CIP to CIP*) and (2) spatial separation of the ions (CIP* to SSIP*). As the top chart shows, the free energy is dominated by the process of solvent rearrangement like the Marcus theory of electron transfer. Image courtesy of Roy et al., Journal of Chemical Theory and Computation, copyright 2017, American Chemical Society Enlarge Image. Reactions inside fuel cells, batteries, and more are controlled by the behavior of pairs of ions in water. Scientists struggled to understand how water influenced the reactions. Theorists at Pacific Northwest National Laboratory (PNNL), led by Dr. Gregory Schenter, designed a simple, elegant method that shows how water moves around pairs of ions and influences whether they draw together or stay apart. Why It Matters: Ion-pairing controls chemical and biological processes. Associating or joining ions involves complex motions of networks made of water molecules. The team's new approach improves the understanding of ions and how they pair. The results will let scientists predict, control, and tune structure, function, and dynamics of ions and the associated processes. Summary: Reactions in fuel cells, batteries, and human cells are controlled by the association or dissociation of ion pairs in water. Water molecules cluster around the ions. Scientists have struggled to understand how water influenced the reactions. Traditional computational models often contain too much information to reveal the essential features of the phenomena. Enter a team from PNNL. These theorists designed a simple, elegant method. It shows how water moves around pairs of ions and influences whether they draw together or stay apart. The team's framework draws from Marcus theory, developed by Rudolph Marcus in 1956. Marcus theory was originally designed to calculate how fast electrons transfer between molecules in solutions and has been extended to address other transformations. The theory garnered Marcus the 1992 Nobel Prize in Chemistry. To develop the new theory for ion pairs, the PNNL team explored two aspects of ion pair association and dissociation: the distance between the ions and the number of water molecules around either the individual ion or the ion pair. Applying the new approach, the team revealed that ion dissociation occurs in two stages. First, there is an increase in the number of water molecules around each ion. Second, the ions move apart. For ions to join together, water molecules must move out of the way. Water moving is the critical, rate-limiting step. The team's method offers an improved understanding of ion pairs that will allow researchers to control and tune structure, function, and dynamics of ion pairs in different systems, from proteins' interactions with DNA to ions' motion in batteries. Sponsors: S.R., C.J.M., and G.K.S. were supported by the Department of Energy, Office of Science, Basic Energy Sciences, Division of Chemical Sciences, Geosciences, and Biosciences. M.D.B. was supported by Materials Synthesis and Simulation Across Scales Initiative, a Laboratory Directed Research and Development program at Pacific Northwest National Laboratory.